Shares of the flooring specialist bounced back as hopes seemed to grow for a full recovery. Shares of Lumber Liquidators Holdings, Inc. (NYSE:LL) were moving higher last month, though there was little company-specific news out on the stock. The retailer of wood flooring and other related products had been battered in recent years after a scandal involving illegally treated flooring, but investor confidence seemed to be returning along with a general uptick in home-improvement stocks. According to data from S&P Global Market Intelligence, the stock rose 18.4% in March. As the chart below shows, the gains mostly came during the last few days of the month. Lumber Liquidators stock reached its highest point in nearly two years on the rally, a sign that investor confidence is returning. As a cyclical, home-improvement retailer, Lumber Liquidators is the type of stock that should have benefited from the post-election rally, but shares continued to trade flat in the intervening months. As the company continues to dig out of the crisis following a 60 Minutes report that showed high levels of formaldehyde, a carcinogen, in products it was importing from China, it turned in a better-than-expected earnings report in February as comparable sales ticked up 2.8% and its net loss per share narrowed from $0.73 to $0.20. Also, during the last week of March, the company introduced a new exclusive waterproof click ceramic plank product. While that was unlikely to be the catalyst behind the rally, it shows the company is continuing to innovate to attract new customers. Lumber Liquidators stock continued to rise through the first week of April, jumping 7% on April 3 and peaking at a closing price of $23.19 the following day. The timing of the rally continues to be unexplained, and analysts still expect the company to post a loss this year. 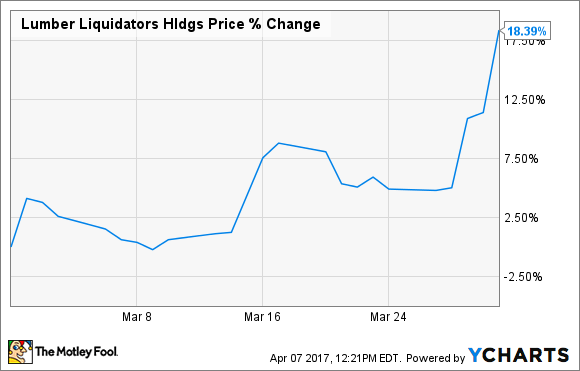 However, as the formaldehyde scandal fades further into the past, Lumber Liquidators is bound to return to profitability eventually. The stock was likely to rally sooner or later.